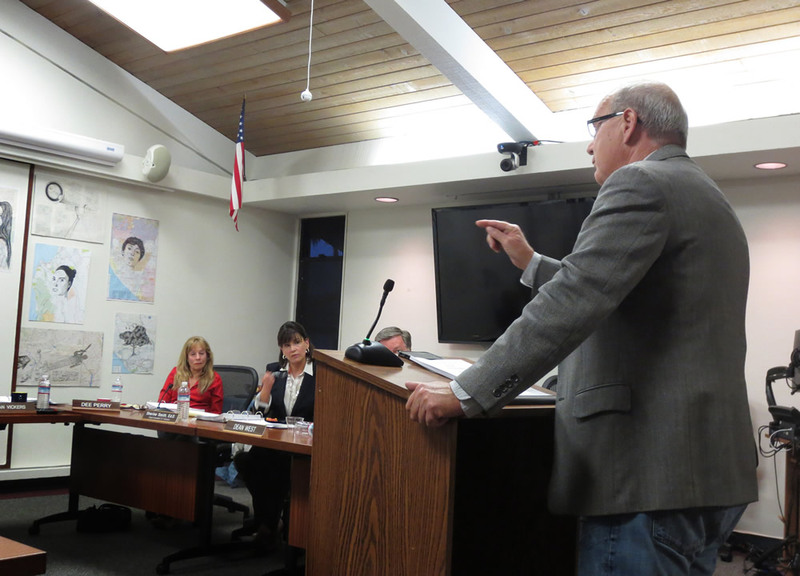 After years critiquing the actions of Laguna Beach school board members, Howard Hills now wants to join them. “It’s the last thing I thought I’d do,” the 64-year-old Hills maintained in an interview. He said he decided to become a candidate at the behest of a network of people who asked him “to help the board.” The only public office he previously held was as student body president of his graduating class at Laguna Beach High School in 1970. A lawyer and former aide to Republican politicians, Hills has been a persistent presence in recent years at school board meetings. He is known for questioning school policies, district administrators and board members in a confrontational manner that has sometimes strained relationships. Howard Hills makes a point during a recent school board meeting. His barbs often pricked retiring Supt. Sherine Smith, who was asked about the impact of Hills’ queries. “It is gratifying to hear that another person is interested in running for school board. I have heard that several people are interested. We appreciate Mr. Hills sincere and frequent input and use it to refine our processes and procedures when relevant,” she answered in an email. William Landsiedel, the current board president who is not seeking re-election in November, has another perspective. “I have serious reservations about Howard running for school board,” he said, citing Hills’ conduct at board meetings, including personal attacks and voluminous requests for public records. “All of this has resulted in the district spending large sums of taxpayer’s money on trivial issues which never show any misconduct. I cannot remember one time that Howard was right on the law,” said Landsiedel, a two-term board member whose children will be leaving the district by next fall. Hills said he has made only one formal Public Records Act request, while other informal requests for public information made at meetings were redirected to the staff at the suggestion of the superintendent. “So the idea that I am pestering them with questions by participating in meetings is wrong,” he said. Board incumbent Jan Vickers, who is seeking re-election Nov. 8, assessed Hills’ public records requests differently. She said he raised legitimate questions about the interpretation of laws related to school governance. In a Jan. 2 message to Hills, Vickers acknowledged the validity of one of his protests over an alleged bylaw violation, which prompted her to call for a fresh reading of a reserve fund policy. The matter involved a $10 million transfer from a reserve fund. “I commend Vickers for convincing the board to fix the problem based on my recommendations, after studying the public information I had requested,” Hills said. Landsiedel also questioned Hills’ fitness for office due to his peripheral tie a decade ago to the influence-peddling scandals that sent lobbyist Jack Abramoff to prison. “I am shocked he is running,” said Landsiedel. Hills, an expert on territorial law who provided legal services to the Guam courts, was indicted by a Guam grand jury in 2006 for his role in an alleged conspiracy to improperly funnel $324,000 to Abramoff without proper disclosure. The funds were from the Guam Superior Court, which had hired Abramoff to oppose a federal bill to reorganize the courts on the Pacific island. After a reputation-bruising two-year ordeal, prosecutors concluded Hills had been wrongly indicted for undue influence, and all charges against him and co-defendants were tossed out. “My entire clientele did not change and my law practice thrived and increased from 2002 when the Guam case started until 2008 when it ended in exoneration,” Hills said in an email. Among friends, Hills’ bombastic style is seen as a sign of determination. 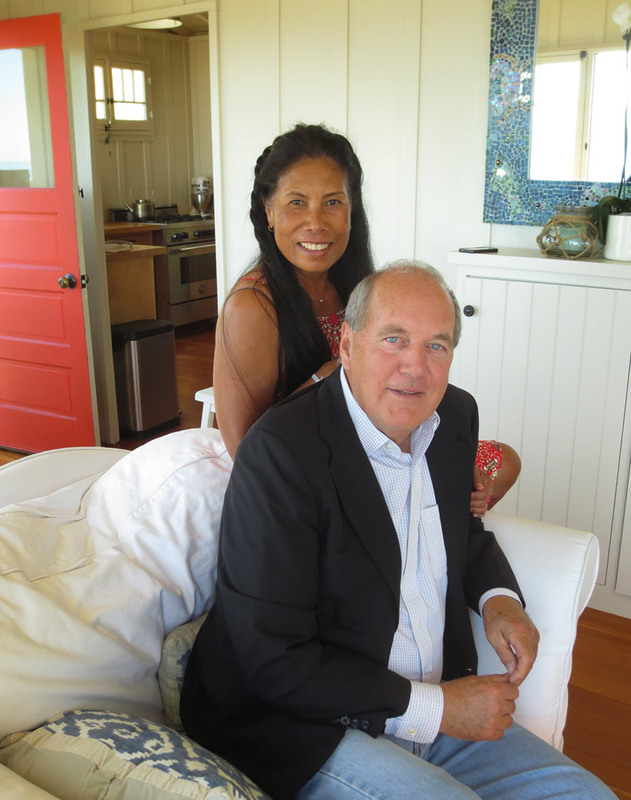 Howard Hills, 64, a candidate for the as yet uncontested open seat on the five-member school board, with his wife, Lura, in their Laguna Beach home. Photos by Marylinn Young. Vanderveen thinks Hills’ demeanor injects “healthy tension” into the proceedings and he’s impressed by Hills’ knowledge of the U.S. Constitution. “Howard brings excellent governance to the table,” Vanderveen said. Hills graduated from California State University Sonoma in 1974 and from the California Western School of Law in San Diego in 1977. He went on to volunteer with the Peace Corps and enlisted in the U.S. Navy, serving as a lawyer who received three service commendations. He would go on to work as legal counsel assigned to the National Security Council and Executive Office of the President during the Reagan administration. Currently, Hills says he earns a living as a legal scholar and legislative and treaty consultant, which gives him the freedom to surf and nap on the beach. He works out of his home where he resides with his wife, Lura. Hills volunteered in the local schools when their children were enrolled and in recent years led the alumni association. More recently, he worked as an aide to Rep. Dana Rohrabacher, led the Laguna Beach Republicans and wrote a book that examines the history of Puerto Rico. Hills remains licensed to practice law in Washington, D.C., and Guam. Bar records show his status as inactive, as he doesn’t reside in either place, but he says maintaining a license allows him to re-register as needed. Another friend, Michele Hall, intends to vote for Hills. “I think he would be a good commander. The board needs leaders,” said Hall, who unsuccessfully ran for City Council in 2014. If elected, Hills says he would streamline the use of consultants on projects and redirect the funds to invest in teachers. He thinks the district should offer teachers scholarships to further their education as well as entice more community involvement at public meetings by offering child-care. Hills takes a measure of credit, along with support from board member Dee Perry, for improving public access to board proceedings by pushing for the installation of video-taping archives and live online streaming on the school website, which began in January. If elected, he also says he wants to enlist more young couples to become school-leadership activists. “There’s nothing in it for me; it’s a civic duty. I should have a campaign that says, ‘Please don’t vote for me.’ But if I am elected, I will go to every meeting, be prepared and making sure governance is restored,” he said. Despite a clear passion for his hometown’s schools, Hills’ candidacy provokes questions about his relationship with Abramoff, who was imprisoned in 2006 in a high-profile Indian gaming case. Less well known is what happened in Guam. In a Jan. 24, 2008 letter, Guam Assistant Attorney General Lewis Littlepage said Hills was not involved in the conspiracy and withdrew the criminal indictment. Guam Superior Court Judge Michael J. Bordallo signed an order to expunge the public record on the matter Feb. 11, 2009, according to a stamped document Hills provided. A public auditor’s report cited irregularities in the Guam Superior Court’s methods for making lobbying payments through Hills in 2005. In a rebuttal in the report, court administrators maintain the payments were made legally. Hills initially declined to discuss the case, but later agreed to if the matter was in a separate story. The Indy declined. Hills filed his candidate intention statement last Nov. 16, though he has not filed required forms to collect funds for a campaign, said a spokeswoman for the county Registrar of Voters. Official nomination forms are due July 18 through Aug. 12. If no other challengers emerge for the two open seats, there would be no election and Hills and Vickers would be sworn into office. The article “Familiar Face Bids for School Board” in the April 29 edition imprecisely described the status of Howard Hills’ campaign. The article quoted a spokesman from the county registrar, who said Hills had not yet filed a statement of organization establishing a committee to collect contributions. At the time, the reporter was unaware that official candidates may collect contributions of up to $2,000 before election law requires a public disclosure of campaign organization and donors. Thus, no further filings of Hills were required when the article was published and the Indy regrets that some readers may have inferred otherwise. Thanks for your article about the new candidate for school board, Howard Hills. Oddly, the article says a great deal more about current board president Bill Landsiedel than it does about Hills. From it, we learn that (1) Landsiedel believes that publicly questioning the board is equivalent to “wasting taxpayers’ money” and (2) anyone who has ever been wrongfully accused of something should be treated as guilty. Perhaps Landsiedel is being especially open with his opinions because he is not seeking re-election; either way it’s shocking. Education is supposed to be about opening people’s minds, so it’s especially sad to see such closed-mindedness in the current leadership of our school board. I have known Howard since 1975 when we were roommates and attending California Western School of Law in San Diego, and he has been a good friend for the past four decades. I was Student Body President at Big Bear High School around the same time Howard was doing the same thing in Laguna Beach. Howard has sought to improve the world in whatever way he can. For example, He was a patient advocate at three mental hospitals in West Virginia, as part of an externship program at Cal Western. Thereafter, he be came a Peace Corps volunteer in Micronesia, and then joined the Navy. He has always been an inspiration to me, and a respected friend. I am sure he make an excellent board member. Sincerely, Dr. William B. Cleary, attorney/professor, Hiroshima Shudo University.